The Breakdown: On ‘Don’t Ask, Don’t Tell’ Repeal, What Are We Waiting For? Last month, the House of Representatives took steps toward repealing the military's discriminatory DADT policy, pending the results of a Pentagon study on the issue. But what impact could the study have on the repeal of DADT? President Obama has repeatedly promised to end the "Don't ask, don't tell" policy banning gays, lesbians and bisexuals from openly serving in the military. Last month, the House of Representatives took a concrete step towards fulfilling that promise by amending a major defense appropriations bill to include a DADT repeal. But there is a catch: the policy would only be repealed after a Pentagon study on the issue is released in December. 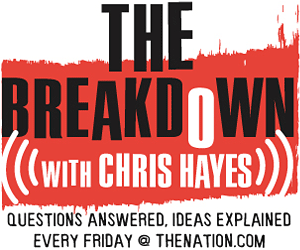 On this week's edition of The Breakdown, DC Editor Christopher Hayes asks University of Pennsylvania Law School professor Tobias Wolff about the impact the Pentagon study will have on the repeal of DADT. President Obama has repeatedly promised to end the “Don’t ask, don’t tell” policy banning gays, lesbians and bisexuals from openly serving in the military. Last month, the House of Representatives took a concrete step towards fulfilling that promise by amending a major defense appropriations bill to include a DADT repeal. But there is a catch: the policy would only be repealed after a Pentagon study on the issue is released in December. On this week’s edition of The Breakdown, DC Editor Christopher Hayes asks University of Pennsylvania Law School professor Tobias Wolff about the impact the Pentagon study will have on the repeal of DADT. More about our guest, Tobias Wolff. New York Times article on the House DADT vote. A 10-year timeline from the Servicemenber Legal Defense Network of DADT.